The one event that’s on the lips of every Southern Californian and beyond these days is Coachella. For two weekends in a row, bands and their followers flock to the desert to take part in an epic experience of music, parties, and of course, fashion statements. The Coachella Valley terrain is dusty, the weather is hot, and showgoers, not even blinking an eye at the occasional dust storm, heedlessly dance come rain or come shine. If you’re headed to Coachella this April, here’s what to pack to ensure your experience, and look, are the utmost in style. [highlight color=”orange”] Floppy Hat [/highlight] Forget the overly trendy flower crown, if you’re going to make a luxurious statement at Coachella, a chic oversized hat is the way to do it. There are so many styles to choose from, but be sure to pick one that you’re not afraid to get a little bit dusty! A great place to shop for designer toppers is Shopbop.com. 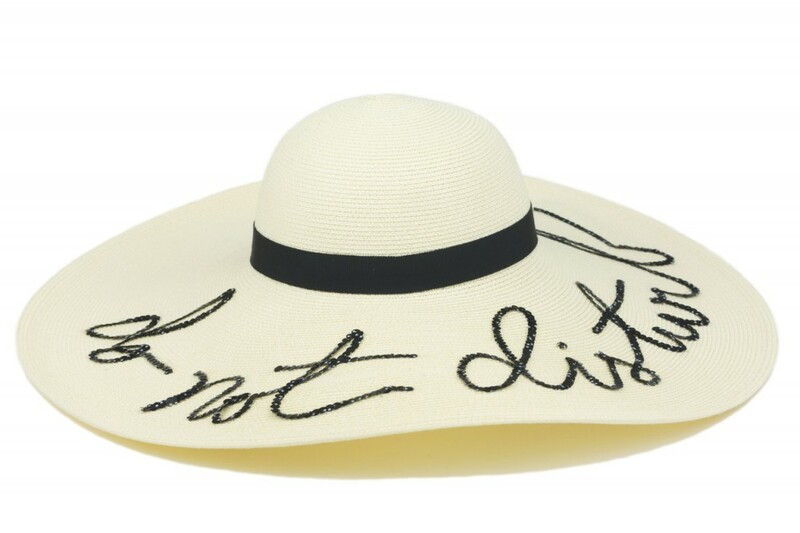 My favorite is this fabulous “Do Not Disturb” floppy hat by Eugina Kim. It sends the perfect message to that blazing sun! [highlight color=”orange”] Comfortable Footwear [/highlight] Coachella may be filled with the likes of models and celebrities, but nobody’s there to strut their stuff down the runway. It’s impossible to dance all day in the wrong shoes. Pronza Schouler will surely get you off on the right foot with their collection of woven sandals and espadrilles. And of course, you can never go wrong with a great pair of gladiators, just remember, comfort is key! [highlight color=”orange”] The Right Bag [/highlight] Losing your phone and the keys to your condo are never chic, darling, and neither are bulging pockets. A cute fringe crossbody is always a good way to go, and lucky for us, backpacks have made a huge comeback and are available in multitudes of awesome tribal prints. Sophia Webster’s “Ziggy” backpack is crafted in leather with neon orange patent leather panels, and features adjustable straps and inner compartments perfect for storing all your loot. Not to mention, it will look amazing with your Proenza espadrilles! [highlight color=”orange”] Shades [/highlight] If you hail from California, you’ve probably got an entire collection of shades. 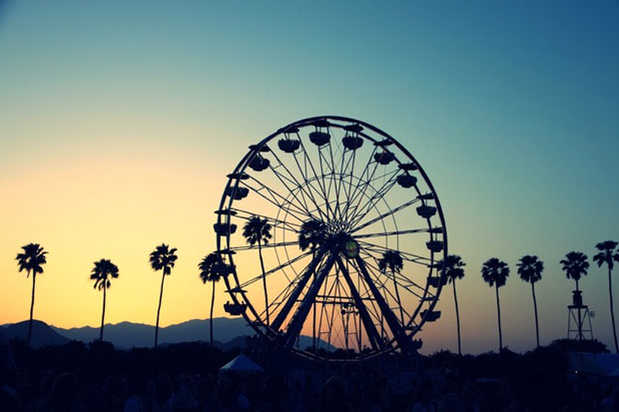 Nonetheless, if you head to Coachella without eyewear, you might end up shedding a few tears, literally. Not only do you need to protect your peepers from the intense sun, you’ll more than likely need a chic shield from dust and other flying objects. The desert is no indoor venue. You can always go the luxury route, but if you’re choosing a lower-priced pair, just make sure they’re UVA and UVB protected! Sunglasses with novelty elements like flowers or other add ons are a great way to incorporate a pop of color and personality into your look. I love Prada’s take on the now trendy flower frames. [highlight color=”orange”] Sun Protection [/highlight] A good sunscreen is perhaps the most important fashion accessory, as is your beautiful skin! There are so many great brands to choose from, and it’s a good idea to bring a quick and easy spray-on sunscreen as well as a few lotions in various SPFs. There are even sunscreens in powder form, like this bareMinerals SPF 30 Natural sunscreen. I personally use Miami Beach Suncare by Destination Brands. Their Sport Spray Sunscreen is SPF 50, and it’s the official suncare of the Miami lifeguards! Well, are you ready for an amazing weekend?! I sure am. Hope that you found this packing guide helpful and that I’ll soon see you out dancing in the desert!